banaras ka khana: masoor daal ka nimona | a winter stew with lentils and cauliflowers..
masoor daal ka nimona | a winter stew with lentils and cauliflowers..
Masoor daal ka nimona is one of those winter stews made in eastern UP that uses seasonal vegetables and lentils in it's full glory. Daals cooked with vegetables and mild spicing would be a good idea to pack in everything in just one dish and have some hot chapatis or rice going with it. Of course there always is some raw salad and some winter pickles on the side for a busy homemaker. Green garlic shoots pickle is one of them enjoyed with such meals. These stews are simple homely flavors, cooked with ease, especially useful for someone who has to cook for a large family or in a limited time, or both. 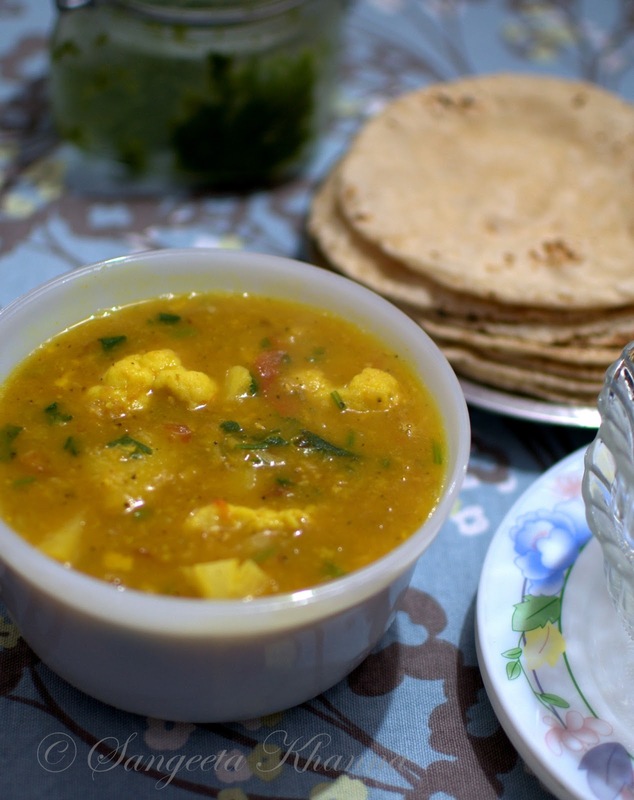 I have tasted many versions of this stew, some had the cauliflowers all muddled up with the daal, some had a few bits floating here and there and some had loads of green peas in it too. Some people added fried lentil vadis to this stew to make them more flavorful. All of them are tasty owing to the taste of seasonal vegetables and liberal use of coriander greens. Actually it was my sister who reminded me of this nimona. She was cooking this one day and called me for something. And then she asked me what was cooking. She was not impressed by whatever I was cooking that day and announced with a gleaming voice that she had made masoor daal ka gobhi matar wala nimona. That too with added vadis. The dinner was decided then and there. Such things make you crave for the long forgotten flavors. Wash the red lentils and cook in pressure cooker with 2 cups of water, the chopped tomatoes, turmeric powder and salt to taste. Cook for 4 minutes after the first whistle blows, lowering the flame after the whistle. Heat mustard oil in a separate pan while the daal cooks, and tip in the cumin. Wait till they crackle and then add the potato cubes and salt to taste. Stir fry and cook for 3-4 minutes on low flame and then add the cauliflower florets and the garlic and ginger chopped. Crank up the flame and stir fry for just 2 minutes more. Add the powder spices, mix well and stir fry for a minute more. Take off heat. Add this cooked vegetables mixture to the cooked daal and let them all simmer for 10 minutes on low flame. The cauliflower florets should be firm but you can cook them mushy if you like. Finish cooking by adding the coriander greens. Serve hot as a meal or as an accompaniment to a roti or rice kinda meal. You can always serve it with some butter or ghee on top. with cook on leave for a week, this is an awesome recipe for to make and i got almost all ingredients to make this !!! Ummm delicious,...feel like eating this right now,..
looks delicious n tempting ..